Pulse Transit Time (PTT) is a measure of pulse propagation time from the heart to another part of the body. To measure this, you need an ECG signal and a Plethysmograph (PPG), typically from the finger. PTT is then calculated by subtracting the R peak time from the plethysmograph peak time on a cycle-by-cycle basis. 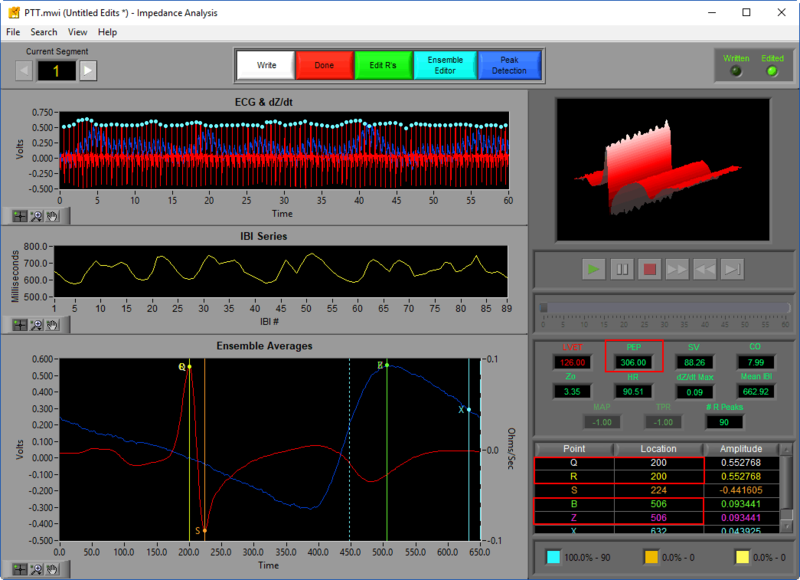 The Impedance Cardiography analysis application is a great place to calculate this, as we perform a very similar procedure to determine Pre-Ejection Period (PEP), albeit using ECG and dZ/dt. 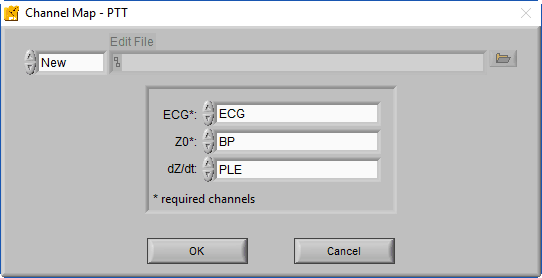 Open the desired file, and on the Map Channels screen map the ECG channel and the PPG channel as dZ/dt. 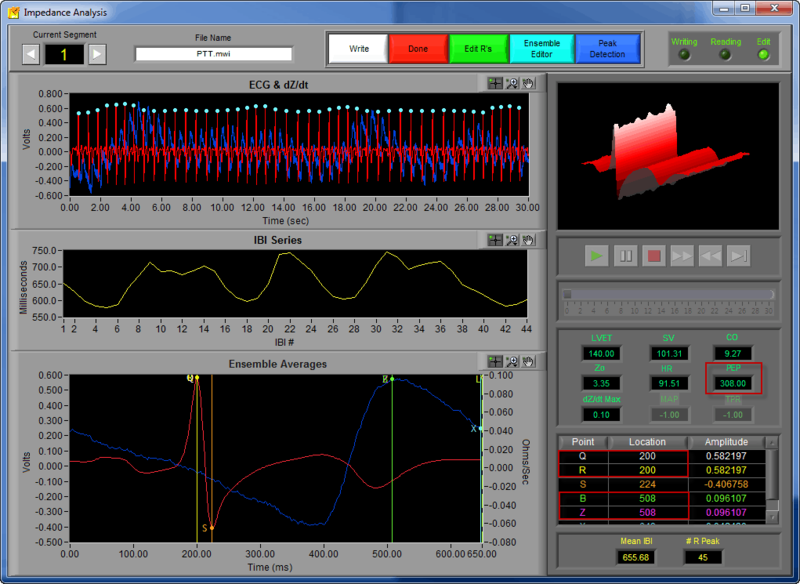 This is so the program uses the PPG signal as if it were a dZ/dt waveform. 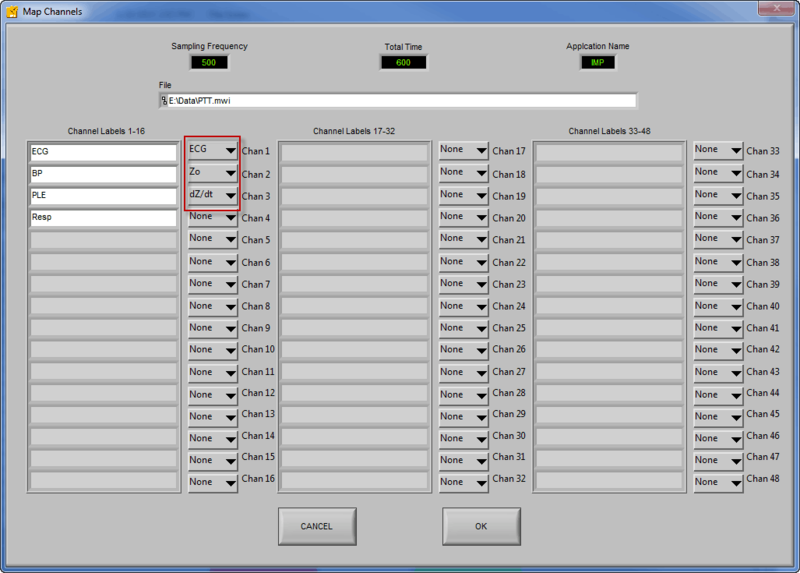 (Note – the IMP application requires that a Z0 channel be mapped. If you do not have Z0 recorded, you can map any other channel in the file as Z0 to satisfy that requirement since we aren’t actually analyzing impedance). 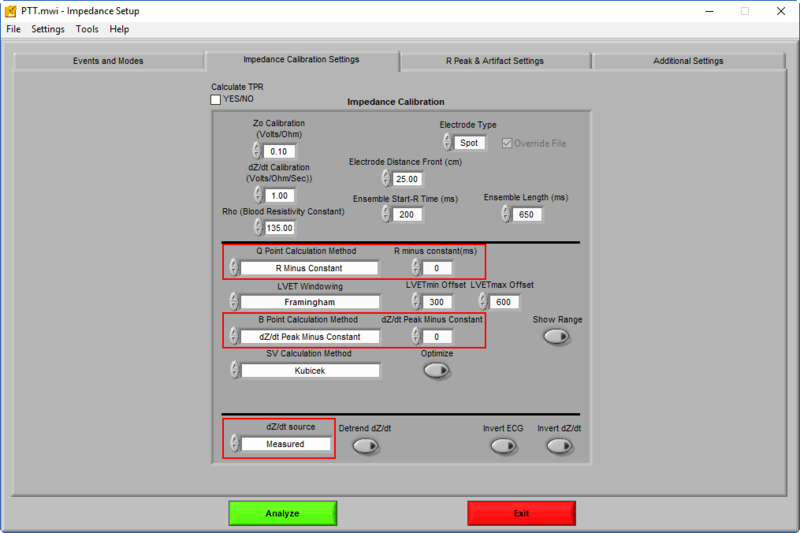 Press OK, and proceed to the Impedance Calibration Settings tab. Pre-Ejection Period is calculated by taking the time difference between the Q point on the ECG waveform and the B point on the dZ/dt waveform. If we make some adjustments to the calculation algorithms for these 2 points, we can use them to get PTT. 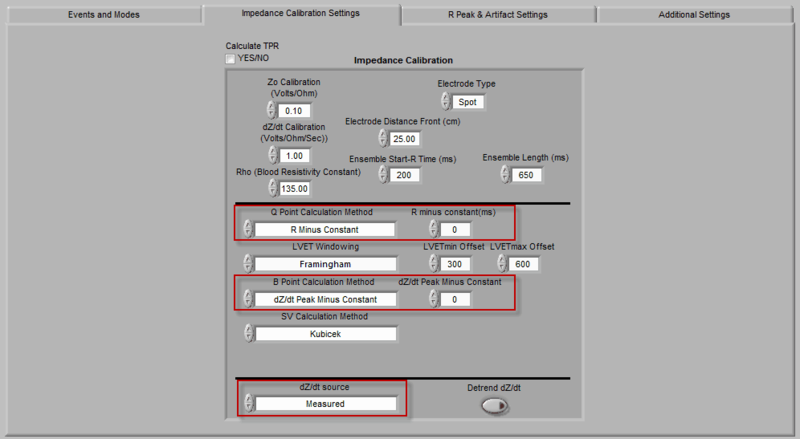 Change the Q Point Calculation Method to “R Minus Constannt” with a constant of “0”. This will place the Q point at the same time as the R peak. Change the B Point Calculation Method to “dZ/dt Peak Minus Constant” with a constant of “0”. This will place the B point at the same time as the peak of the PPG signal. Now proceed to the analysis screen. You will see that the Q point lines up with the R peak, and the B point lines up with the dZ/dt peak. Since the PEP calculation is the difference between these 2 points, PEP = PTT.